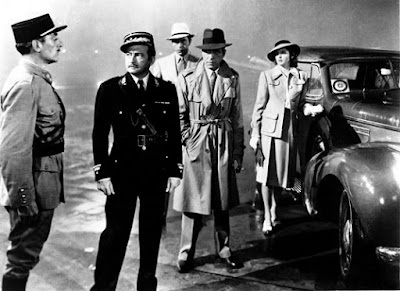 Casablanca is normally celebrated as a happy accident—a dream factory film where everything went right, the quintessence of the old Hollywood studio system, which churned out movies the way Ford assembled cars, on an assembly line to rigid specifications for a product-starved public. When one considers the number of things that could have soured this production, it really begins to look like a miracle: a film that is simultaneously an espionage thriller, a bittersweet romance, an historical drama, a war film, and a deep meditation on politics and personal responsibility. The Plot In Brief: Rick Blaine (Humphrey Bogart) is an expatriate American living in French Morocco during the early days of World War II. For an unspecified reason, he cannot return to the United States. He runs a popular nightclub in the town of Casablanca, where refugees flock to seek transportation to peaceful countries. Rick is famous for “not sticking his neck out for nobody” and not drinking with his customers. Even counting his best friend Sam (Dooley Wilson), Rick Blaine is an island unto himself. 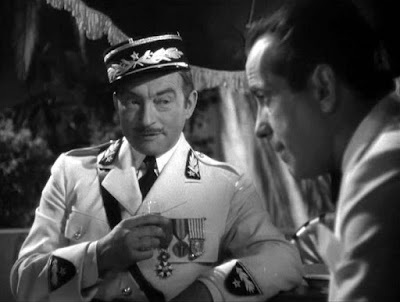 The nightclub serves as a gathering spot for a range of colorful characters, including the greasy Ugarte (Peter Lorre), the suave sociopath Captain Louis Renault (Claude Rains, in the best role of his career), and Carl the waiter (S.Z. Sakall) who seems at times to be Rick’s personal assistant. One night, Rick’s old flame, Ilsa Lund (a luminous Ingrid Bergman) walks in. She is married to international freedom fighter Victor Laszlo (Paul Henreid). Why did Rick and Ilsa’s romance end years ago in Paris? Does Ilsa still love Rick? Will the Nazis capture Victor? Will I make the matinee screening of this film held every year on Valentine’s Day at the Music Box Theater in Chicago? 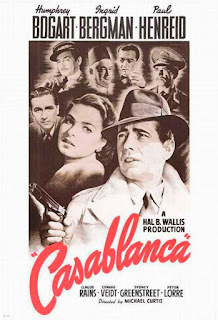 Obviously, one aspect that makes Casablanca so popular is the mystique of its star, Humphrey Bogart. Never a conventional leading man, Bogart is so tough and yet so fragile here—his wounds may have scabbed into the hard surface he shows the world, but we can tell they haven’t healed. This is Bogey’s single best performance in a very long and successful career full of great performances. He is always the coolest guy in the room. He always does the right thing, even when it involves heartache and personal sacrifice. Young men could do worse than choose Bogart’s Rick Blaine as a role model. Directed by Michael Curtiz, Casablanca features a broad bench of supporting actors, all playing to their various strengths: Sydney Greenstreet as Ferrari, playing the ultimate self-satisfied, narcissistic blowhard; Peter Lorre as Ugarte, the ultimate sweaty, simpering rat; Paul Henreid as Victor Laszlo, the ultimate stand-up guy your girlfriend marries after she breaks up with you because he is the safer bet; Claude Rains as Louis Renault, the ultimate witty, charming douche bag; and Conradt Veidt as Major Stasser, the ultimate black-hearted, hiss-able Nazi. Every role in this film is perfectly cast. Speaking of gin joints, I wish Rick’s Café Américain really existed. A precursor to the Tatooine cantina bar—where drinks and life are cheap—Rick’s features live music, a floorshow, and on some nights, a spectacular arrest, murder, or both. For a few years in the 1970s, a Holiday Inn in downtown Chicago had a lobby bar that was an exact replica, but I was only eight years old and not yet of legal drinking age. Thanks for NOTHING, liquor laws! 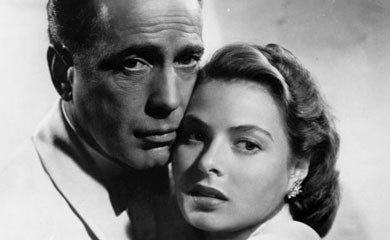 Mrs. Pope has suggested that Casablanca emerges as an instructional movie for how the USA could enter, and help win, World War II. Like Rick, who is heartsick and embittered after his time with Ilsa in Paris, America was still reeling from the one-two punch of World War I and the Great Depression, which partially justified its original isolationist stance on involvement in WWII. The story of Rick Blaine is a primer on the necessity of action against a terrible foe and the benefits of sublimating one’s individual concerns for the greater good. Like Rick, to win the war the USA would need to take risks, make sacrifices, and form alliances. What’s best, though, is that once Rick commits to definite action, he also washes away his sadness and loneliness. He “gets Paris back,” and is congratulated by good guy and world citizen Laszlo, who says “Welcome back to our side.” Rick’s example rouses even the cynical Renault to heroic action. “Louie, I think this is the beginning of a beautiful friendship” isn’t just an iconic line because it ends an iconic film. It’s the first glimpse of a hopeful man who believes in himself again and is ready for—and wants—a life full of other people. It makes me want to cry. A recent article on Slate.com questioned Casablanca’s value and resonance with Millennials. The author suggests the film was revered in the 1970s by hordes of mostly male film fans because it provided both a template for masculinity in Bogart’s Rick Blaine and a bridge between peace-loving Baby-Boom children and their Greatest Generation parents who had beaten the Nazis. In Rick Blaine, she suggests, we find the missing link between personal stasis and communal action. I found the article thought provoking but odd. 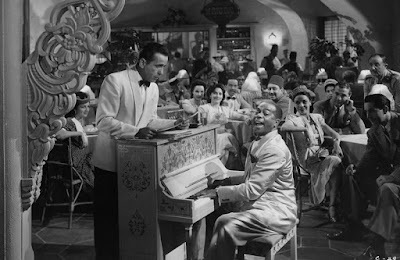 For a critical essay trying to prove Casablanca’s contemporary irrelevance, it spends a lot of time talking about everything that still makes it a great film. Could the larger thesis here be that, like their parents’ old furniture, old clothing, and old ideas, Millennials have little patience for anything not invented during their lifetime? You can read the original article here. I do agree that Casablanca can function as a bridge between generations. I once had five uncles on my mother’s side; each had a very distinct personality, and I liked them all very much. Uncle Billy was the movie buff—a Bogart fanatic—and we always had that between us. We would talk about old movies and he would do his mediocre Humphrey Bogart impression. I was twelve, and I thought this made Uncle Billy the coolest guy in the room. I miss him. Casablanca’s Three Miracles: The perfect cast; the perfect script; and the perfect confluence of subject matter, timing, and world events. SPECIAL NOTE TO THOSE IN THE CHICAGO AREA: The Chicago Film Critics Association’s monthly classic screening in April will be Casablanca. The Daily Herald’s Dann Gire will introduce the film and lead a discussion afterwards. The screenings are at the Elk Grove Cinema on April 12th, at 12 noon and 7:00 pm. Admission is only five dollars. In nomine Bogart, et Bergman, y spiritu Michael Curtiz, Amen. Great article. I'm looking forward to that Elk Grove screening! 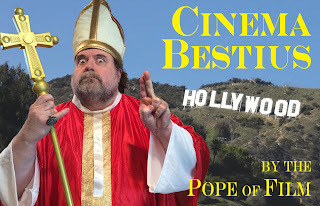 I thought for sure this was going to be the Pope's #1. If I had to guess at the top 2 (and I do), thinking about the all-time greats that have yet to appear, I'm going to go with The Godfather, and Most Wanted, starring Keenan Ivory Williams. We don't have Bigger, Longer & Uncut yet. I would have guessed it be at the number 6 or 7, but I won't argue against top 2. No surprise, as we all know his Holiness has a penchant for the blessed musicals. "I am shocked, SHOCKED, to find that gambling is going on here!" "I'd like to think that you killed a man. It's the romantic in me." [Re: a wager he's making with Rick] "Make it 10. I'm only a poor corrupt official." Claude Rains was a dude in general - but here he's at gis best! This was a blind-spot of mine for years. One of those movies that I heard so much about so often, I felt as if I had already seen it. A self proclaimed movie buff since I was a kid I finally sat down in my early 30's (I'm 47 now) to see what all the fuss was about. I saw what all the fuss was about. Bogart's brief, gut-wrenching reaction to seeing Bergman at the piano with Sam.